Welcome to Dr. Nana Girgis McMahon’s practice. Whether you are a brand-new parent, parenting a teen or even a grandparent, we want to guide you in your efforts to provide your child an environment that optimizes his or her physical development and emotional health. We provide personalized pediatric expertise in a respectful, collaborative environment. We look forward to working with your family. Insurance provider must be informed that Dr. McMahon has been selected as your primary care provider. 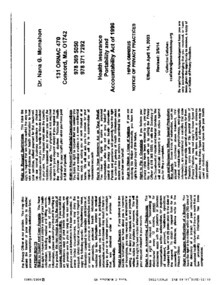 Copies of all pertinent medical records from prior physician(s). Records of immunization history from birth. Patient registration information, including HIPPA, patient portal documentation, and patient demographics, must be completed and filed with our office. 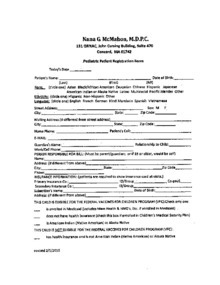 Once you schedule your first visit with our office please print out patient registration forms below, fill them out and bring them with you to your visit along with your insurance card and copayment. Please bring any pertinent records from your previous physician with you. If you are expecting your first child, new to the area or changing your child’s care and would like to visit our practice to meet with Dr. Nana Girgis McMahon please schedule a get acquainted visit. This complimentary visit helps you become familiar with us, where we are located, and ask questions regarding our practice and your child’s care.